One of the most significant highlights of 2016, for me, was the phone call I received the night before Labor Day to inform me that Familias Unidas por la Justicia and Sakuma Brothers Farm had signed a legally binding agreement outlining how the two parties would settle a four-year-long labor dispute on Sakuma Brothers’ berry farm in Washington State. Sakuma Brothers is a major supplier to Driscoll’s, the largest distributor of berries in the world, and to Häagen-Daz ice cream brand, among others. 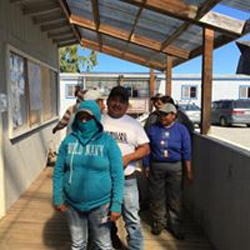 Until this year, management at Sakuma had refused to recognize the farmworker union, denying them the right to collective bargaining and undermining the spirit of freedom of association. In May 2016, Fair World Project mobilized thousands of consumers and dozens of organizations to sign a letter in solidarity with Familias Unidas. Following this, Fair World Project was invited to play a role in facilitating the dialogue between Familias Unidas and Sakuma Brothers Farm. The September agreement was a historical moment and outlined a way forward for both organizations. It focused their attention away from historic tensions and differences and toward their shared interest in the viability of the farm. As I think ahead to 2017 and ponder the current divisive political climate, what I learned on my journey this year has given me hope and also provided some concrete lessons to inform my organizing going forward. These lessons may be useful to others concerned with food security, worker rights and economic justice, as well. Farmers and farmworkers have similar interests and must work together. Farmworker leaders of Familias Unidas sat down with Danny Weeden, the new CEO of Sakuma Brothers Farm, early in the summer. It took nearly four years to make this happen. The first meeting was short, no more than one hour. But it was already a new beginning for the farm. Farmworkers are the most marginalized part of our food chain, but farmers often do not fare much better and both are often at the mercy of corporate power and concentration further up the chain. Farmers and farmworkers committing to working together can improve the economic, social, and environmental sustainability of farms. Both Familias Unidas and Sakuma showed tremendous leadership and commitment to finding a mutually beneficial outcome. This shift is welcomed and needed. Climate change is real and already having an impact. A lack of legal framework does not prevent action. Our request of Sakuma was that they recognize Familias Unidas as a union and honor their request to meet. Farmworkers had already won some improvements over the course of four years of organizing, but still wanted formal recognition and a contract. The right to organize is a fundamental human right. Yet the law does not provide a framework for farmworkers to collectively bargain in most states. In the case of Sakuma, this meant before negotiations could begin, an agreement about steps leading up to a negotiation, including a fair election, needed to be crafted. This agreement, signed on the eve of Labor Day between Familias Unidas and Sakuma, can now serve as a model for other farms. It serves as a reminder that even in the absence of a legal framework, there can be paths to meaningful action. It takes many people working together to accomplish real change. For the first time in years, Sakuma’s berry season will start next year with a contract, not mired in conflict. This is no easy feat and took the support of many. Myriad roles were played, whether it was farmworker leaders on the farm, volunteers who supported farmworkers on the ground, thousands of consumers who signed petitions, farm staff who worked to secure a neutral election site – they all contributed to this accomplishment. Anyone who wants to support the fight for economic justice and labor rights for the people who produce our food can play a role. Conscious consumers can engage and respond to appeals from farmworkers to support their on-farm struggles and policy campaigns in numerous ways. Whether you join a struggle directly, or show solidarity by looking for opportunities to buy products verified by farmworker-led certification programs or that carry a union label—everything we do matters.Grassroots organizing, creative solutions, recognition of economic and environmental realities and greater collaboration will be even more important in the coming months and coming years. I am grateful for the experiences and models that show us what is indeed possible and necessary in working for transformative social change. Sakuma Brothers Farm’s main crops are strawberries, blackberries, blueberries.